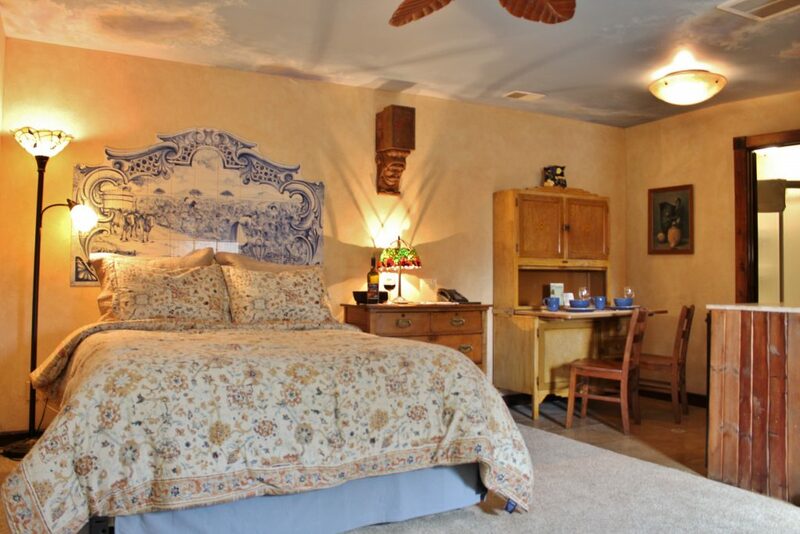 Stay in our distinctive bed & breakfast nestled in the rolling hills of the Shawnee National Forest. Located just above our winery tasting room, you will enjoy spectacular views of our 12-acre vineyard from your own private balcony or simply sipping a glass of Illinois wine from the patio overlooking our waterfall. Experience a “Taste of Tuscany” in the heart of wine country and appreciate the ever-changing panorama of Southern Illinois. We have two luxurious suites available for rent year-round, each with their own private bath. Each suite is furnished with antiques but also contains all of the modern conveniences of today’s living for a more enjoyable stay. Phone, microwave, mini fridge, satellite TV and DVD are available in each suite. As an added bonus, our Tuscany Romance Suite includes a balcony that overlooks our wine bar with an additional balcony overlooking the Shawnee Hills. A European style breakfast is a great way to start the day. Hot coffee, fresh fruit, juice, croissants and wholesome deli meats and cheese are provided. After breakfast, enjoy sampling wine in our tasting room, complete with 200 year-old Portuguese tiles, hand carved doors from Romania, and vintage windmill ceiling fans. Explore our vineyard, or the unparalleled beauty of the Shawnee National Forest during your stay. Tour the Shawnee Hills Wine Trail or enjoy an antique adventure in one of our unique Southern Illinois towns. Venture to Blue Sky Vineyard and experience the splendor that we have to offer. Whether sipping a glass of wine on our patio or visiting one of the many historical or natural sites in the area, Blue Sky Vineyard is sure to leave you with a memorable experience. Ask about a free tour of our cellar with our winemaker if you stay with us Monday – Friday. Where Comfort and Economy Combine. 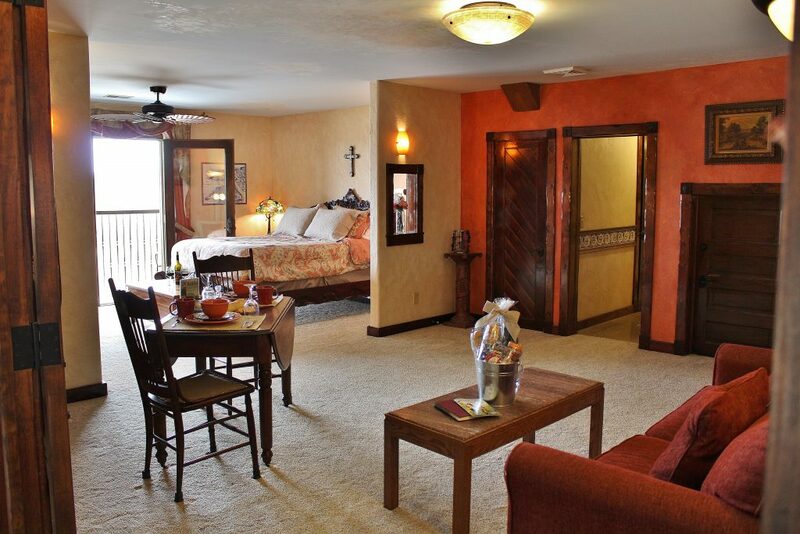 A cozy and quiet retreat, our Blue Sky Suite offers intimate relaxation with all of the amenities you need to unwind after a busy day of hiking or traveling the Shawnee Hills Wine Trail. Where Sophistication Meets Comfort. Our Tuscany Romance Suite is the larger of our two suites and includes an open living room with sofa and an open dining room area. Savor your wine selection from the balcony overlooking the rolling hills of southern Illinois or tuck yourselves in for a relaxing evening in.